If you read my last post, then you know my first experience with amateur photography was with a Kodak 110 Instamatic camera around the age of ten. About six years later, Kodak came out with a new instant camera that worked like a Polaroid. It was called "The Handle," and I just had to have one! I asked my Dad and step Mom to please buy me one! They said that they would buy the big clunky camera, if I got to attend the band trip to Canada. So I got this camera as a reward for raising the $2,000.00 required for me to attend an International high school band competition in Vancouver. Each band student had to raise that amount mostly by selling raffle tickets for a new car. All the other band students got to start their fundraising as soon as school started, but I didn't transfer to that particular school until January of my sophomore year. So, I got a later start. 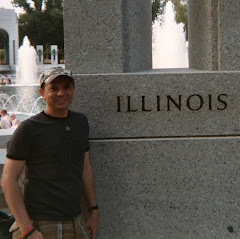 But I was determined to earn that week long trip to Canada Not only did I achieve the goal of $2,000.00, but I also raised an additional $400.00 to help out another student. And so my parents kept their word and bought me the "The Handle" camera! Here's a short television commercial that came out the year "The Handle" went on sale. I was disappointed in the camera after receiving it and should've just stuck to my 110. Even in sunny Phoenix, my photos never had bright brilliant color as Kodak claimed in their ads. In the bright sun, the photos would be washed out and too bright. 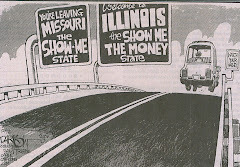 Here's some sample of my favorite photos that I took in May of 1978 with "The Handle." I chose to share some photos that had fairly good color quality for that time. To save space here, I have cropped out the border around the photos, except for the last one. It was nice to able to write underneath the pictures, but you had to have a special marker to do that! I took this photo of the Capilano Suspension Bridge in Vancouver right before I got up the nerve to walk across it. 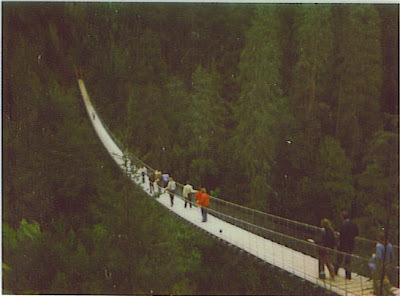 I had to think about it for a long time, because I was afraid of heights and also you could see the bridge swaying. 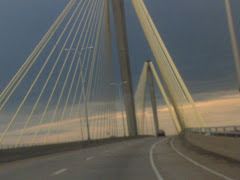 I realized it was a rare opportunity to see such natural beauty, so I cast aside my fears and walked across the bridge. I'm glad I did, because it was a truly magnificent experience. This photo has a lot of color, but I was still disappointed in how dark it came out. It was taken on a sunny day at The Butchart Gardens in Victoria, British Columbia on Vancouver Island. 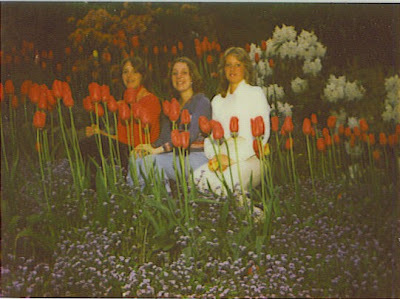 These are three of my close friends back then doing a quick pose at a spot where they weren't supposed to be at. They were careful not to trample any tulips! 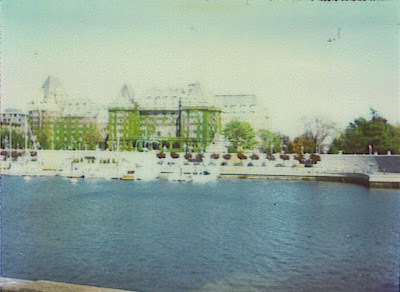 This is a harbour view of the Empress Hotel at Victoria. See what I mean about how "The Handle" couldn't handle the bright sun and would wash out the photo. Maybe that's how Kodak came up with the name! Imagine what the pictures taken in sunny Phoenix looked like. Let's just say, I wasted a lot of money on film for "The Handle." 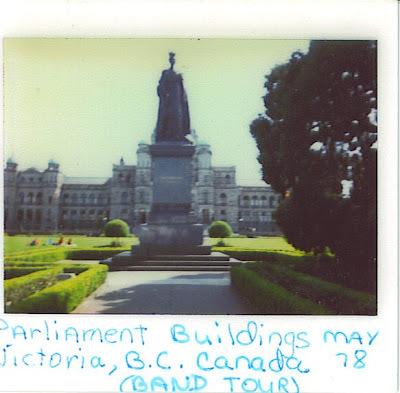 Obviously from my writing on the above photo, this is one of many pictures that I took at the Parliament Buildings. This picture shows how "The Handle's" photographs look with their border. brought a patent-infringement lawsuit against Kodak, and eventually Kodak was forced to stop the manufacture of both the camera and film. My "The Handle" became worthless and was soon sold very cheap at a garage sale! I went back to using my 110 Instamatic camera for many years after that. I had a Polaroid; I think 600 was the type, or maybe that was the film pack. It was fun when I used it, but years later, the photos have all faded to a mere shadow of their former brightness. I still have the camera, but I don't know if they even still produce the film for it. I had one of those worthless Polaroid cameras too. I don't even know what happened to it. It was junk anyway. I couldn't have crossed that bridge. No way. I get afraid of heights shown on TV even - I am so paranoid of heights. Wow...I never heard of "The Handle" before. I think that's because in 1978 I was already married and raising my family which left me little time or money to think of a new camera. I never was a fan of the Polaroid camera. I did have one of those, but I didn't like the quality of the pictures. To be honest, the best pictures I had came from my 110. Even now, I can't stand my digital camera, even though it's a fairly expensive one. I still like the 35mm I used to have better.